The LA Bike Working Group, made up of cyclists from around the city, is meeting this Saturday in East Hollywood to develop grassroots recommendations for the LA's Draft Bike Plan, an element of the Transportation Plan which is part of the City's General Plan. City Planning and the LADOT recently released the Draft Bike Plan, an element of the Transportation Plan which is part of the city's General Plan. Cyclists charge that the 42 day comment period is insufficient for meaningful review and significant contribution, further charging that the entire process is simply a charade and that the Draft Bike Plan actually proposed less bike lanes and bike paths than the old Bike Plan. Two weeks ago, Dr. Alex Thompson presented the Cyclists' Bill of Rights to the NC Action Summit as one of the six issues that were on the agenda for action. 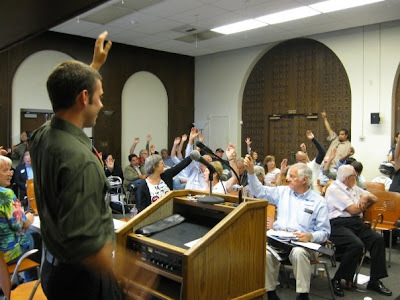 The CBR received a 50-1 endorsement and it was at that point that the neighborhood councils were asked to support the cyclists by 1) calling on City Planning and the LADOT to extend the comment period for the Draft Bike Plan to 90 days 2) calling on City Planning and the LADOT to include the Cyclists' Bill of Rights in the Draft Bike Plan and 3) asking for a inventory of the Craft Bike Plan improvements within the neighborhood council boundaries. Since then, the Valley Alliance of Neighborhood Councils voted unanimously to call for an extension of the deadline for public comment. The Los Angeles Bicycle Advisory Committee voted unanimously to call for an extension of the deadline for public comment. Neighborhood Councils are working to agendize the call for an extension along with the call for an inventory of their community, all while the clock ticks. The hard charge here is that in many cases, the Draft Bike Plan has actually removed bikeways amenities from the plan, resulting in a retreat rather than an advancement, which makes one wonder why it takes a $450K plan in order to do less, rather than more. The cycling community is asking for support in developing a powerful visionary document that will begin with "Consider all streets as streets that cyclists will ride." and that will continue with real language of imperative rather than simple suggestions and hopes and wishes. This plan, like all plans, belongs to the people of Los Angeles and it must be a plan that reflects the wishes of the community. It must be an improvement, it must integrate with the other plans that cover the community and it must have teeth. ● The Rate Payers Advocate Task Force which will meet on October 24 at 1pm, immediately following the SLAP meeting. (4th Saturday) For more information visit the DWP Ratepayer Advocate. ● The Sidewalk Repair Task Force will also meet on October 24 at 1pm, immediately following the SLAP meeting. (4th Saturday) For more information visit the Sidewalk Repair Program. ● The Budget Reform Task Force will meet on November 7 at 1 pm, immediately following the LANCC meeting. (1st Saturday) For more information visit the City Budget Reform. ● The Medical Marijuana Task Force will meet on November 14 at 1 pm, immediately following the PlanCheck meeting. (2nd Saturday) For more information visit Medical Marijuana. ● As for the 1/2 Off Initiative, the campaign is moving forward and the organizing committee is taking on volunteers and funding. For more information visit Half off Initiative. To follow upcoming NC Action Summit events visit the calendar at the NC Action Summit website.